1. Preheat the oven to 220°C, gas mark 7. Put the potatoes in a roasting tray and toss in 1 tbsp olive oil with the garlic. Season, add the lemon halves and roast for 25 minutes, adding the tomatoes after 15 minutes. 2. Meanwhile, heat a griddle pan on a medium to high heat. 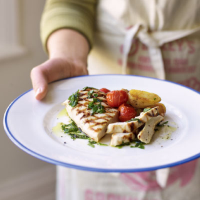 Brush the chicken breasts with ½ tbsp olive oil, season and griddle on each side for 6-7 minutes until cooked through.